Discovery Conference will take students to the EDGE of their comfort zones! 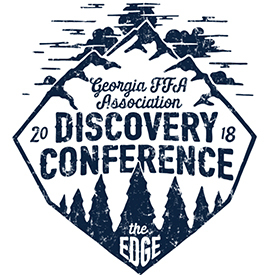 Join us January 25-26, 2018 at Georgia FFA-FCCLA Center in Covington, GA as we go to the EDGE of our leadership capability. Topics range from Personal Discovery, Personal Growth, Agriculture, and Opportunities in FFA. The Conference will be facilitated by YOUR 2018-2019 State FFA Officer Team.Check with your Ag Teacher for more information!